An Old Time Christmas at Silver Dollar City is one of the most visited attractions in Branson during the holiday season. From November 4 to December 30, 2017, you’ll enjoy a great time with the whole family as you see the popular theme park transformed into a glittering Christmas wonderland. “An Old Time Christmas” at Silver Dollar City is a good example why Branson is considered by many visitors as the best place to enjoy the holiday season. The 1.5 million lights that adorned the Christmas Midtown, is a seasonal sight to behold for the entire family. With the thousand trees that are adorned with dazzling lights and everywhere you look, you’ll discover the true spirit of Christmas during this glorious holiday season. During “An Old Time Christmas” at Silver Dollar City, you’ll get to enjoy two Broadway-style theater productions, as well as delicious holiday meals and special treats like hot wassail, hot apple dumplings with cinnamon ice cream, and tasty cappuccino. Weather permitting, there are more than 30 thrilling rides and attractions await visitors during this holiday season, and shopping can be enjoyed in every corner especially at Jingle Bell Junction, where you’ll see 80 themed Christmas trees. Speaking of Christmas trees, Silver Dollar City’s holiday celebration includes one of the most brilliant attractions in Branson and a great display of a 5-story Christmas tree on the square. This huge Christmas tree features a synchronized light and music show at intervals throughout each evening and a captivating sight to reckon which is something that makes visitors to look forward every year. And don’t forget the Holly Jolly Christmas Light Parade which features Rudolf the Red-Nosed Reindeer and Friends. During Christmas season, Silver Dollar City is generally open Thursday through Sunday from 1 pm to 9 pm. New for 2017, the theme park will also be open all Wednesdays in December. Single-day tickets can be purchased at the gate or online for $61 for adults and $50 for children. The park offers a two-day tickets with just a few more dollars for $66 for adults and $55 for children. Added bonus is also offered if you enter after 7 pm, which allows you to return the following day for no additional charge. This gives convenience to visitors who want to see the lights on the first night and come back the following day for the shows and rides. If you want to visit during the least crowded day of the week, choose Thursday and stop by select Price Cutter locations in Missouri to purchase tickets for just $35 in places such as Country Mart, Ramey, Smitty’s, Summer Fresh, and Bistro Market. Near the park, you’ll find two Country Marts in State Hwy 13 in Branson West and Shepherd of the Hills Expressway. Discounted tickets can be purchased anytime, but it can only be used during Thursdays. 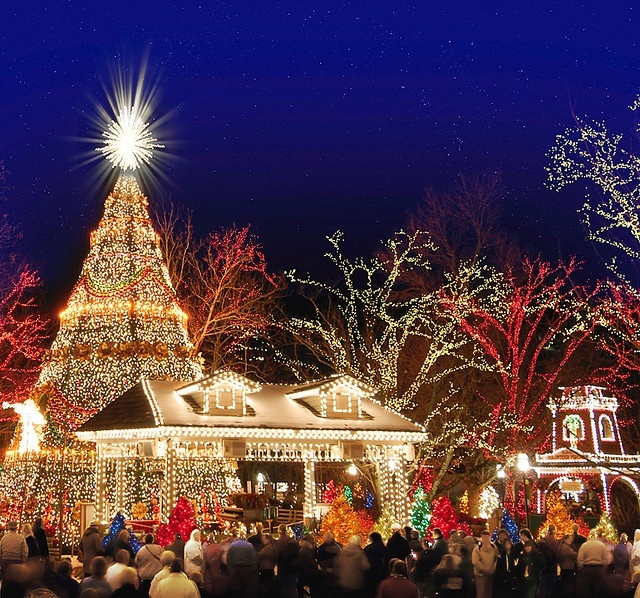 Silver Dollar City’s Old Time Christmas is one of the best attractions in Branson that brings to mind those wonderful celebrations from days gone by.